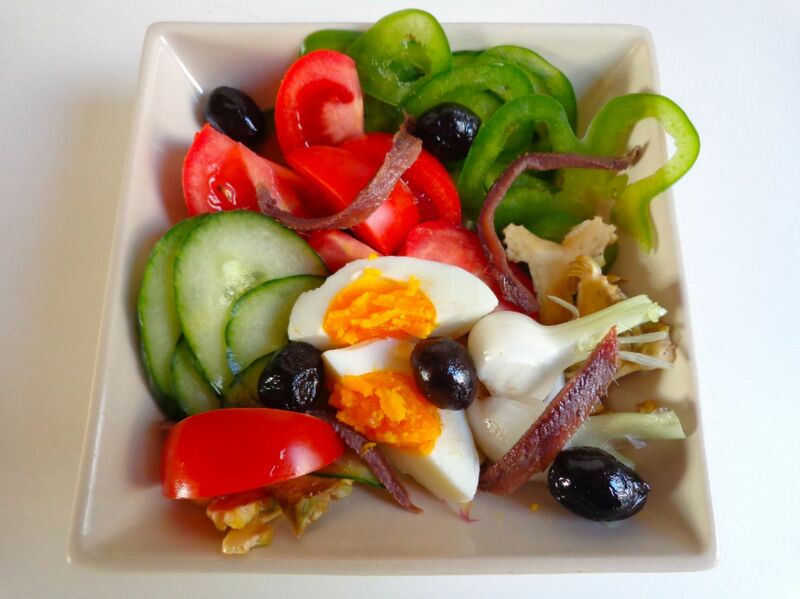 When you're looking for the perfect summer salad, there's only really one possible choice: the famous salade niçoise, first created in the French city of Nice. This Provençal salad has had many recipes over the years, but according to purists, only fresh and uncooked vegetables should be included - and who are we to argue with tradition? As such, we've borrowed a recipe from the late, great Chef Paul Bocuse for this month's recipe. Place the eggs in a saucepan of cold water. Bring to a boil. Cook exactly 5 minutes. Gently tip out the hot water and refill with cold running water, immersing the eggs. Wait a moment and repeat. Leave the eggs sitting in the cold water until ready to shell them (this will make shelling easier). Rinse the tomatoes and cut into wedges, removing the hard flesh around the stem. Rinse the pepper. Slice the bottom half finely into rounds. Remove the core. Slice the top half finely into rounds or strips. Rinse the cucumber and slice very finely on the bias. Peel the onions and slice into thin strips or rounds. If using baby artichokes, begin by preparing a small dish of cold water. Add the juice of half a lemon. Remove and discard the leaves and stem of the artichokes retaining only the heart. Remove and discard the choke. Plunge the hearts into the lemon water — this will prevent discoloration. Remove one heart and slice very thinly. Return the slices to the water. Repeat. Leave the slices immersed until ready to assemble the salad. Peel the garlic clove, cut in half. Rub the inside of your salad bowl with the garlic. Now assemble the salad. Arrange the tomatoes, pepper, cucumber, onions and artichoke slices if using. Peel the eggs, cut into quarters and place them on top of the other ingredients. Cut the anchovy filets in half lengthwise and lay them on top of the other ingredients. Scatter the olives over the salad. For the dressing, pour the olive oil into a small bowl or cup. Snip the basil leaves into the cup. Add some salt (go easy, as the anchovies and olives are already very salty) and grind in some black pepper. Pour the sauce over the salad just before serving. For the authentic French experience, serve with crusty bread and a chilled bottle of dry rosé. This delicious salad serves 2 as a main dish, or 4 as a starter.